Hit the slopes for a day jam-packed with fun and exhilaration at New Zealand’s only indoor snow resort! Just 20 minutes from Auckland, Snowplanet's epic facility boasts an impressive 200-metre slope of fresh powered snow that's kitted out with a variety of jumps, rails, and jib features. Ideal for families, beginners, or seasoned pros - Snowplanet caters to all experience levels and is the perfect environment to brush up on, or discover your snow sporting skills. And what’s best? 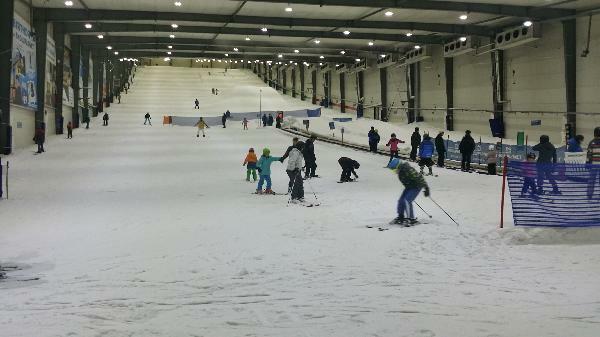 Snowplanet's awesome facility and optimum conditions are available all year round! The day pass is the ultimate option for those wanting to make the most of their experience at Snowplanet. With the whole day ahead of you, you’ll have plenty of time to enjoy a perfect day on the slopes - there’s even a restaurant on site for you to fuel your energy levels! The ultimate day out with friends, family, or to perfect those skills for the coming season! Skis, snowboards, boots, tubing, helmets, clothing, lessons, gloves and F&B are not included in the price. The snow is cold at a chilly -5C so you need to wrap up warm and wear appropriate clothing such as pants, jackets and gloves, all of which are available for hire at the resort, subject to availability. Helmets are compulsory for all skiers and snowboarders and are available for hire for $6 if you don’t have your own. One coupon is valid for one full day pass for one person. Valid at selected date specified only. Does not include; skis, snowboards, boots, helmets, clothing, lessons, gloves and F&B. A $5 refundable card fee will be charged at the time of visit for access to the lifts. No refunds unless required by law. No cashback. Not to be used with any other offers. Best Day for Half the price! Incredible day, great slopes. As a first time Skier, it is a must! Great time had by all. It wasn't too busy and the snow was excellent to snow board on. Hi Sharon, We are glad you had a great time and can't wait to see you again! Great shot by the way! We love Snowplanet but find it too expensive - especially for a family. Being able to go on much reduced costs is a big bonus!!!! Hi Lisa, We are glad you had a great time and can't wait to see you again! Hi Jessica, We are glad you had a great time and can't wait to see you again! Your message has been sent to Snowplanet - Full Day Pass. You should hear from them shortly. Please note: all responses will come directly from Snowplanet - Full Day Pass, and not the team at Bookme.